I am in a position where my work medical plan changed for 2019, and so must find a new dr. DrKeller and his staff are very pleasant and answer questions, as a new patient it was reassuring. I will need a few more visits to really get the feel. But I will go back again, unlike some new dr visits I have had. I am in a position where my work medical plan changed for 2019, and so must find a new dr. Dr Keller and his staff are very pleasant and answer questions,as a new patient it was reassuring. I will need a few more visits to really get the feel. But I will go back again, unlike some new dr visits I have had. Another great and successful visit with the Doctor. I can highly recommend the Doctor and would go see him again. ThanksDoc ! ** Special Policy for New Patient appointments:Please arrive 30 minutes prior to your appointment time and Established patients arrive 15 minutes prior to your appointment, Thank you! A board-certified family physician, Dr. Michael Keller takes care of the medical needs of the local families of Avondale, AZ. He is an integral part of Abrazo Medical Group Goodyear and goes all out to deliver quality care and ensure patient satisfaction. As a primary care doctor, he is uncompromising in his dedication to the well-being of his patients and approaches patient care with compassion and positivity. Dr. Keller attended medical school at the University of Illinois, Chicago. Post medical training, he went on to pursue a residency in family medicine at Resurrection Medical Center. He is also an alumnus of the University of Illinois, Urbana-Champaign, where he earned his bachelor's degree. A seasoned provider, he also holds certification from the American Board of Family Medicine and has been a recipient of several awards and honors. Fluent in English and Spanish, Dr. Keller encourages open communication with his patients which allows him to guide them through their treatment as active participants in their well-being. 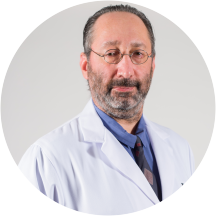 He strives to treat each patient to the best of his ability while ensuring that both patients and their loved ones comprehend the different possible methods of treatment. He gives his patients his undivided attention and practices with a goal of helping each of them lead healthy and fulfilling lives. He is fantastic! Would highly recommend him! Always explains the medications and makes sure I understand the treatment plan. The office was clean and seemed organized. No one appeared to be waiting very long. Dr. Keller completely exceeded my expectations. He listened, responded in an easy to understand manner and was very personable. I've definitely found my PCPof choice and would recommend him to anyone. I never leave reviews so that tells you how impressed I am. Dr. Keller best doctor I have ever had. He has found things no one else was able to, treated me with respect and honesty. He doesn't pull punches, and if you want honest care with someone who doesn't just go through the motions, this is the guy. Wonderful experience! The office staff were very friendly and efficient. Dr. Keller is very personable and took time to hear my health concerns, as well as provide options for gaining an understanding of my needed and next steps. Exemplary experience! Dr Keller had obviously reviewed by chart and was ready to discuss my visit. As always, Dr Keller listens to my comments first - that's one thing that makes him such as good medical provider. Very knowledgeable and thorough, direct and to the point, very professional. I've been seeing Dr. Keller for many years. He's great-- I especially appreciate his diagnostic skills. I've been able to avert, manage and/ or cure many issues. Dr. Keller is friendly, knowledgeable, and he really cares about his patients. Dr. Keller, don't ever retire!!! Professional, knowledgeable. Listen to my problem and knew quickly what needed to be done. Makes you feel very comfortable and makes sure all of your questions are answered. Dr Keller is a great doctor! He seems to really care about people! If I were not already a Registered nurse, he would inspire me to be in the medical field! From the receptionist to the end of my visit, thisoffice is top notch in making customers/patients feel like they care??. I highly recommend Dr Keller! Watch out for prescriptions. My default is a mail order pharmacy so when I need one time drugs they send the order to the wrong pharmacy. Took two trips to the doctor's office, half hour on the phone with the mailorder people, and nearly 40 minutes of the pharmacist's time just to get the prescription resent to a local pharmacy. Alternative was to wait 4 to 5 days to start antibiotics or pay for the drugs myself and spend a month attempting a reimbursement from a federal program. So far so good. Was my first appointment with him and so far he seems very thorough and understanding. He took his time and did not rush me and made sure to ask questions. I have high hopes. Dr Keller was very pleasant and professional. He listened to, and addressed my issues. Prompt, thorough and explained everything well. It was as thorough as always! Dr. Keller has a great beside manner and my children like him a lot. He was able to answer questions and offered a good treatment plan that we could agree upon together. Dr. Keller was really nice and I didn't feel rushed through the appointment which is always good. Office staff was friendly too. I think Dr. Keller is a very good doctor. He takes his time to listen to you and does a thorough exam. His breath of knowledge and willingness to look at the entire picture is exceptional. He doesn't limit he suggestionsand advice to "traditional" MD type solutions. I trust him to provide me with me needed medical advice and those people I care about. He has a life long patient in me and my loved ones. Dr. Keller and his MA was wonderful. Went today for well-child checks. Took care of all of our needs, spent time with any concerns, and made sure we understood the recommendations. Office staff is friendly and always willing to assist. Thanks! He the best- and I really respect his medical opinion's & how he explains everything to me He our Family Doctor & I been with him for a very long time & I feel confident that i have a primary carethat is just not a Doctor but someone i can count on , He like Allstate Insurance , Your in Good hands with" Doc. Keller"
Very attentive. Relaxed but professional. I especially like having the Lab in same office as it is very convenient. Dr Keller and office staff are very efficient. This was my first visit to see Dr. Keller. The front office person was very helpful and cheerful. The wait time to be called back was less than 15 minutes. While I as in the exam room I did not haveto wait long before Dr. Keller saw me. He listened to me and decided on a plan of action for me along with a net work of additional professionals to assist me. I had blood drawn while I as there. Not a long wait. The phlebotomist was extremely gentle. very little wait. Dr. Keller spent appropriate time with me and made sure all of my questions were answered. Dr. Keller is knowledgeable and easy to talk to. Gives good advice. Also, being available on the weekends makes all the difference in the world. Thank you! My son felt comfortable with Dr. Keller. He is easy to talk to. Excellent doctor, availability, and excellent staff. I would recommend him to anyone looking for a great doctor. Was impressed. Will be looking forward to more meetings with him. He seemed like a doctor and professional. He listened to me. I received all the pertinent facts. He looked at me. The staff has a barrier between them and you(their computer monitor). Would be better if their monitor was lower. Excellent input & sincere interest in my prolonged well being.